Our Boston Location Will Re-Open in 2019. On 10/9-5/3, our Boston Location Is closed. Thanks for a great season and we'll see you in May! Fort Point Channel is a happening place, and you can experience that excitement on our Harbor Kayak Tour from Fort Point Channel! 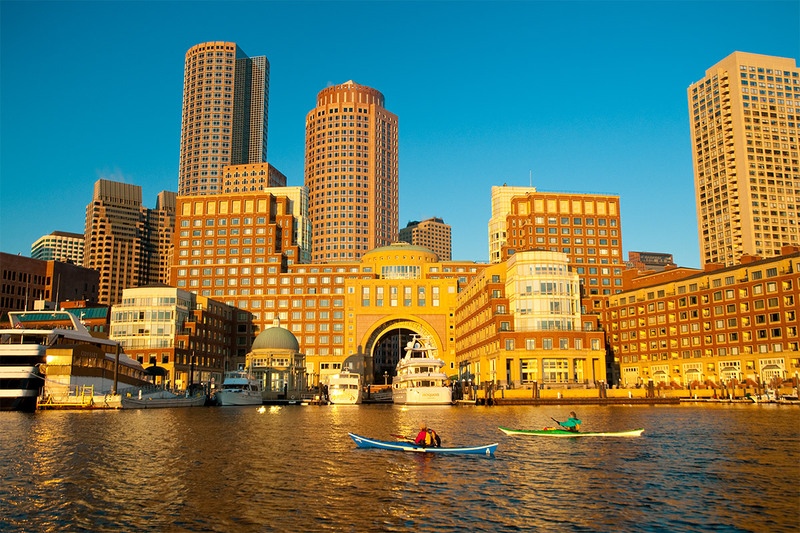 Get the best skyline view in Boston, Get amazing skyline views like this on our Harbor Tours from Fort Point Channel. see landmarks like Rowe’s Wharf (at right) and the U.S.S. 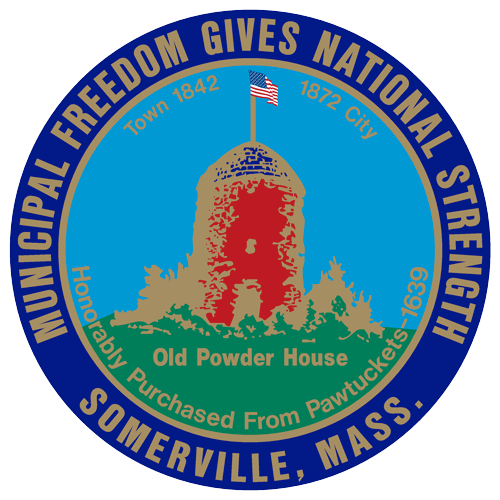 Constitution, and follow up your tour with a meal at one of the area’s amazing restaurants. 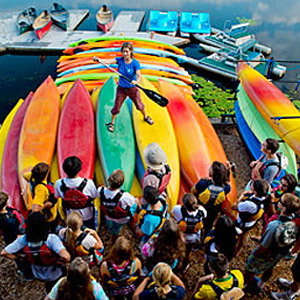 This two-hour tour is designed for paddlers of any level. 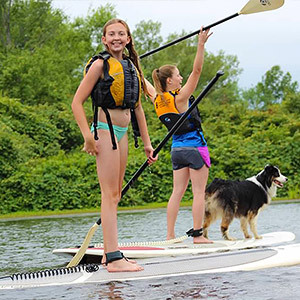 Our tour will begin with a quick introduction to kayak strokes, then we’ll launch our double kayaks and begin our paddle past the Boston Tea Party replica ship Beaver and toward the Harbor. After passing under the old Northern Ave swing bridge, the panorama opens up, with the skyscrapers of Rowe’s Wharf to our left, the distinctive Moakley Courthouse to our right, and East Boston across the Harbor. 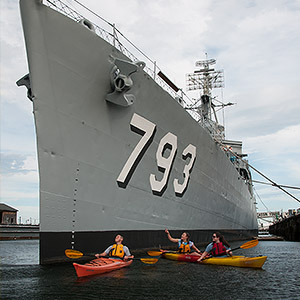 We’ll paddle north along the waterfront, passing the New England Aquarium on the way to Charlestown Navy Yard to view the U.S.S. Constitution, U.S.S. Cassin Young, and other ships berthed there. As we return to Fort Point Channel, we’ll see historic sites like Old North Church and learn about the history of the area and the role the Harbor has played in Boston’s development. Even if you’ve lived here your whole life, you’ll learn something new, funny, and exciting. a Corporate Event Create your own private tour for an unforgettable group or corporate outing! While not a regularly scheduled event, we are happy to run a private tour for your group. Contact us for info on pricing and scheduling Reservations are required. 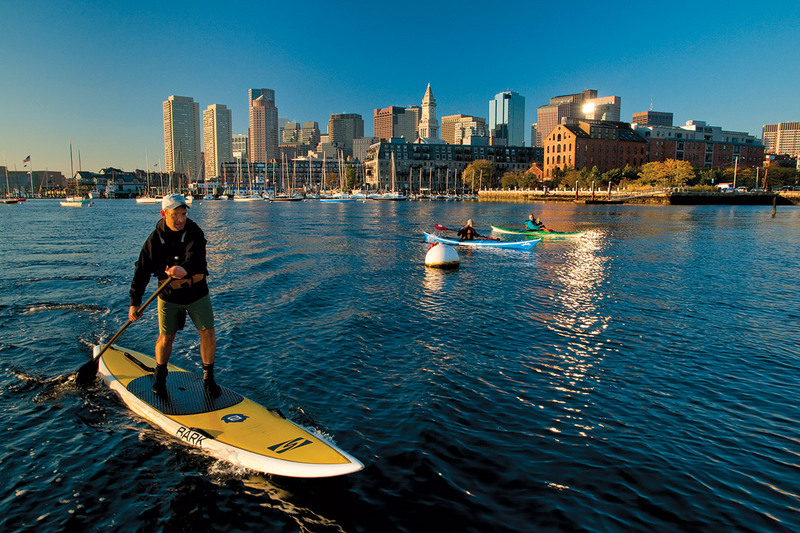 Explore the Boston Harbor standing up with this tour from Fort Point Channel! 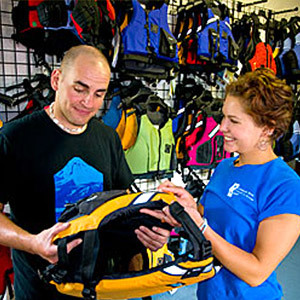 We are happy to arrange custom tours for groups of 10 or more. 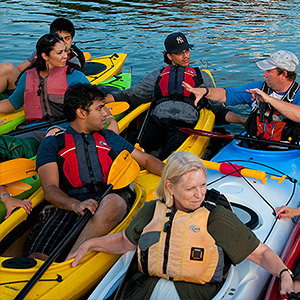 All of our tours begin with a quick instructional session to get your group standing up on the water. We'll explore Fort Point Channel, including the Tea Party Ship Beaver, then poke our heads out into Boston Harbor to enjoy the best view of Boston's skyline. 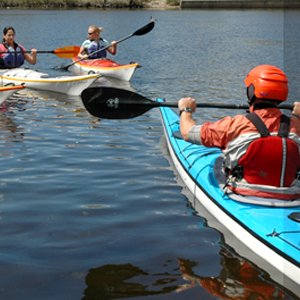 SUP Tours are available by reservation only for groups of 10 or more. Click here to request a date or call (617) 965-5110 for more information. P&G Gillette has graciously provided a wonderful dock in the heart of downtown Boston: Fort Point Pier. Our Fort Point Channel Harbor Tours start and end at this dock. 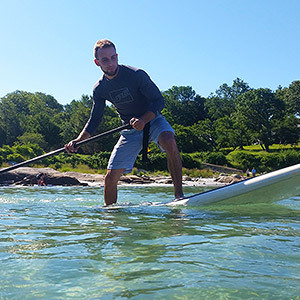 If you have your own kayak or SUP, you may launch or land your boat here. There is ample reasonably priced parking adjacent to the dock. Learn more at FortPointPier.com. or Harbor Tour from Kendall Square!